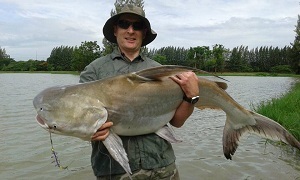 UK angler Steve began his holiday predator fishing in Thailand at IT Lake Monsters for Chaophraya Catfish. On arrival at the IT Lake Monster Predator Lake the angler chose to start fishing with carp tactics for one of the lakes large Giant Siamese Carp. Having prebaited a spot prior to his arrival Steve cast a large method/groundbait packed feeder onto the marginal spot. Fishing started very slowly with no action on the first few casts although fish seemed to be in the area. A fast take soon saw the angler bent into a good fish which took off across the lake on a searing run. The unseen predator stayed out on the lake embarking on a series of powerful runs. Continued pressure saw the fish soon brought towards the nearside bank where it soon showed itself to be a large Chaophraya Catfish. On netting the Chaophraya Catfish it was quickly brought onto the grassy bank and unhooked. The Chaophraya Catfish was estimated to weigh 45kg’s and safely released. The Carp fishing continued but failed to produce any carp. Steve’s patience was rewarded by a few smaller catfish on the carp rod before it was time to change over to bait. The change over to bait saw the angler land a succession of predators which fell to both live and dead bait predator fishing tactics. At the end of the days predator fishing the angler had landed a nice mixed bag of predators topped by a big Chaophraya Catfish in addition to several Redtail Catfish.